As a nation, we don’t talk about money, and we certainly don’t talk about money problems. But for millions of people across the UK, money is a serious problem. Earlier this month we released new figures on debt showing that one in six people are struggling with problem debt but, despite the scale of the problem, it’s all too easy to feel alone. The stigma around debt, and talking about money at all, is one reason why only one in five people actively seek debt advice – and why people often delay seeking debt advice for up to a year after their financial problems begin. And it’s not just debt. Across the country people lack ‘financial capability’ – the skills, mindset and confidence to manage their money well. Money Advice Service research found that four in ten adults are not in control of their finances and one in five cannot read a bank statement. When people are experiencing mental health difficulties, dealing with their money well can become even more challenging, and too often money problems and mental health problems can go hand in hand. Our research suggests that more than half of the people using the debt services we fund also experience mental health problems. This is perhaps not quite as surprising as it seems. Many of the events that can trigger financial problems – redundancy, separation, bereavement – can also contribute powerfully to stress, anxiety or depression. The sense that your money is out of control can all too easily feed into a wider sense of helplessness and despair. And evidence – from Martin Lewis’ Money and Mental Health Policy Institute and others – that people with some mental health conditions are prone to going on ‘spending sprees’ which can lead to financial difficulties. But the good news is that getting the right help with your money can also help with your mental health. After getting debt advice from services we fund, more than two-thirds of people said that they were sleeping better, and were less stressed. But clearly it’s not just an issue for people with unmanageable debts. Anyone can experience mental ill health – as many as one in four of us will in any one year. And this may mean we are less able to focus on everyday money management, or planning ahead for the future. Or we may lack the confidence or the motivation to deal with important financial decisions, plan for the future and engage with guidance and advice. And that means we are much less likely to be making the most of our money. 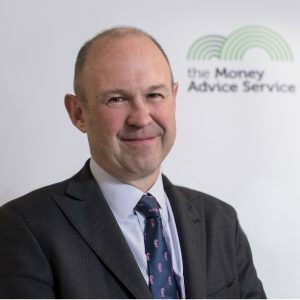 The Money Advice Service is working to turn that around, leading the UK Financial Capability Strategy, and driving practical action to support the Strategy. Through our What Works Fund, we are supporting local projects in Northern Ireland and London, to build evidence of how we can best engage with people experiencing mental health problems and help them to take control of their money through a support offer that truly works for them. And we are working with Mental Health UK to support them – with content and digital services – as they develop a new money guidance service specifically for people with mental health conditions. In November, we’ll be holding the second annual Financial Capability Week, and we’ll be looking to get more people talking about money – including ways of supporting people experiencing mental health issues. The theme of the week is #talkmoney – because we need everyone from every walk of life and across every sector to do their bit to start talking about money with family, friends, colleagues, employees and clients. Just like mental health, we need to put money on all of our agendas.